Let’s start at the beginning. Walking in to the site-specific venue, I was greeted with a friendly Namaste from Shecky Sheckleman (played by Howard Pressburger), some live music and a studio full of perfectly laid out colourful yoga mats. Just like a kid in a candy store, I couldn’t decide what mat I wanted to sit and do yoga poses on. Everything looked all pretty and once on the mat, I was eager to find out what I would be doing next. The class began with chanting and some humorous moments with the call and respond chant. The integration of Judaism and yoga was clever and I’m all for laughter in class! There were moments in the show however that I felt myself tuning out. Generally in yoga that is not a bad thing but as it’s a show, I felt that some of the dialogue could have been clearer and stronger. For example, Shecky’s releationships with his yoga assistant, Hannah Mann (played by Shana Sandler), was wonderful but it would been great to see them connect more. 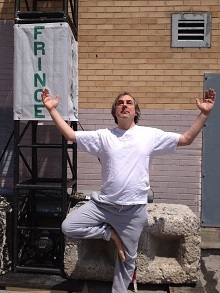 With all that said, I did love learning some of the fun new almost dance-like movements that were well integrated with a gentle yoga flow practice and pranayama (breath work). I especially loved the integration of the philosophy of yoga and yoga sutras.! This class is for all levels and it is beginner yoga with loads of choices for modifications! Bring comfortable clothes as you will be moving around. The concept is brilliant and I am sure this is just the beginning for Shecky’s Yoga!